In 2006, when Gary Shotton purchased Auto-Turn Manufacturing, Inc., he knew what he wanted to do. 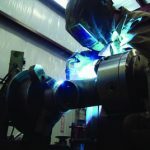 With an engineering background and process-oriented mindset, he saw improvements that could be made with his shop from day one. Since the shop had been around the Tulsa, OK area since 1983, he knew he needed to take a hard look at where his company could improve and make some big changes. Auto-Turn produces component parts for a wide variety of industries including aviation, oil pipelining and the fracking industry. When Gary came into the company, he realized quickly that his team was working with antiquated systems with little to no consistency across departments. Many department leaders had their own Excel spreadsheets and databases that weren’t communicating with other departments. Sharing information about accounting, payroll, quality standards and production needs was extremely difficult. He set out to find a system that would help bring his shop into the 21st century. The E2 integration with QuickBooks was seamless and quick. When there were questions, E2’s support team was there to address any issues. Like with most companies, any time you implement new software, there’s always a learning curve. But according to Gary, with E2’s support team Auto-Turn always gets the information to solve the problem. Gary admits that he works with a team (Gary includes himself in that bucket as well!) that sometimes like to ask questions after they’re hopelessly lost. E2’s support team gets them back on track in minimal time and the field reps are flexible and accommodating to get to the shop if they don’t get what they need from a phone call. Since the on-boarding of E2 in 2006, Auto-Turn has systematically implemented several E2 modules including the Advanced Quality Control, the Data Collection, the QuickBooks interface as well as the Advanced Scheduling module. Auto-Turn also uses E2 to maintain its ISO certification. While the shop was ISO certified prior to Gary purchasing the company, E2 has made maintaining that certification nearly effortless.